BOMB PROOF® Plate Loaded Seated Shoulder Press Machine - The BP-93 American Made Plate Loaded Shoulder Press by Bomb Proof is built tough for commercial-duty use. Thanks to the 25.5 wide handles that adjust from a height of 35 to 46 in 1 increments, lifters can isolate the side deltoids using their preferred range of motion during military presses. The BP-93 has a compact footprint and robust frame fabricated from both 2 x 2 and 2 x 3 11 gauge steel tubing. 8 long weight horns offer enough loading space to satisfy the heaviest lifters and have a 25 degree angle to hold plates in place and keep them from sliding off. Customize the fit of the BP-93 further with the adjustable back pad. Bring it forward to better isolate the side delts or push it back to put more emphasis on the front delts. 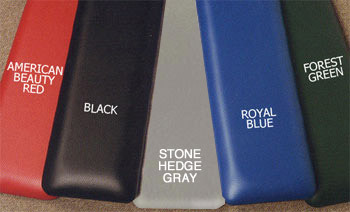 Choose from several frame and padding color options. Need a custom color scheme to match your existing equipment? Contact an Ironcompany strength equipment expert today for availability. Weight plates NOT included.